Sean O'Brien has cried about his decision to leave Ireland but isn't prepared to give up on his international career without a fight. The British and Irish Lions flanker is joining London Irish from Leinster after the autumn's Rugby World Cup. The IRFU do not select players who are based overseas with French-based duo Simon Zebo and Donnacha Ryan among those being currently overlooked. "Afterwards I would hope to still be in the mix if possible," he said. Johnny Sexton remains Ireland's only overseas player who continued to be called up while playing club rugby beyond Irish shores during his two-year stint with Racing 92. Yet O'Brien is refusing to give up on his Test career. "If I'm fit and well I think I can add value to this group, even after I leave Leinster I'd hope to be selected," said the 32-year-old. "There's always hope there, I think, that regardless of where you are you're still in with a shout if you're playing well enough. "Because I am contracted to the World Cup it is what it is at the minute. But you never know what will happen about it. "Until the World Cup finishes that is all up in the air." 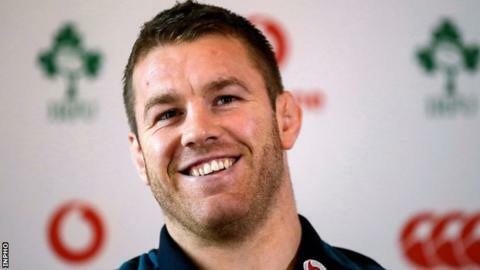 O'Brien, who has won four European Cups and two league titles since joining Leinster in 2008, says he has not spoken to incoming Ireland head coach Andy Farrell about his move to London Irish, where he will link up with former Ireland head coach Declan Kidney. The Exiles have a nine-point lead at the top of the Championship and are expected to earn promotion to English rugby's top flight. Attracting a player of O'Brien's experience and class is a huge coup, but the two-time British and Irish Lions' tourist admitted the decision was extremely difficult. "There's been a few tears shed over the last few months thinking about all of this," he added. "When you do make your final decision, it's a tough place, at the end of it all you're just packing your bags and you're walking out the door and moving to a different club. "It was probably the toughest thing I ever had to do, was to move away. I never thought I was going to be in that situation but that's the way it goes sometimes and that's professional sport. "I know at the end of my contract that I will have done what I could for Leinster, to the best of my ability in those 10, 12 years. That sits well with me. It's not going to be a case of me leaving with a load of regrets."